Cranworth is a parish in central Norfolk, and encompasses several hamlets, including Letton, Southburgh, Wood Rising and Cranworth itself. The gently rolling landscape of the parish is typical for one situated on the central clay soils, with a large number of medieval moated sites, ancient woods, and small hamlets. The history of the parish is a complex one. There is some evidence for early occupation. A Mesolithic axehead (NHER 2967), and several Neolithic axeheads (NHER 2939, 8796 and 8797) have been found scattered throughout the parish. The sites of several ring ditches (NHER 25987, 29826 and 36388), probably dating to the Bronze Age, are visible on aerial photographs. 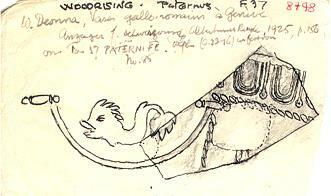 The site of a Roman villa (NHER 8798) was discovered during deep ploughing at Wood Rising in the 1940s. Large amounts of brick, tile, glass and tesserae were found on the site. Another area of Roman settlement (NHER 40976) has been discovered in the north of the parish, where metal detecting has recovered a number of coins and pottery fragments. Roman coins (NHER 24225 and 35119), pottery (NHER 8821 and 8824), brooches (NHER 24015), and other metalwork (NHER 24015) have been found scattered throughout the parish. Cranworth, from the Old English meaning ‘an enclosure frequented by cranes or herons’, was listed in Domesday Book as a fairly substantial and valuable manor, with a large amount of woodland. Saxon strap and harness fittings and other metalwork (NHER 31641 and 33912) have been found around the village. The site of a medieval moated manor house (NHER 8827) is close to the village. St Mary’s Church (NHER 8828) dates mainly from the 14th century, and the nearby former rectory, Cranworth House, was built in the 19th century, with classical architectural details, replacing an earlier building. 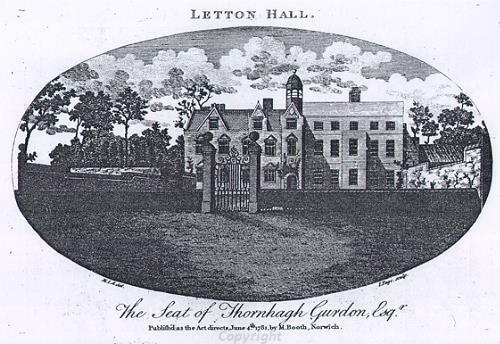 Letton Hall, Cranworth in 1781. Letton, which means ‘a leek enclosure’ in Old English, is in the north of the parish, and although a small settlement in the Domesday Book, was listed as having a church, although the ruined remains of All Saints’ Church (NHER 2769) cannot be dated with any certainty. The village of Letton was deserted by the 16th century, and the earthworks of the medieval village (NHER 2769) have been incorporated into the landscape park (NHER 30515) surrounding Letton Hall (NHER 2775). A medieval moated site and a series of medieval fishponds (NHER 2766) have survived to the north of the Hall, and another medieval moat (NHER 25721) is visible on aerial photographs. Letton Hall itself (NHER 2775) was the first country house to be designed by Sir John Soane, who also laid out the formal gardens. The Hall, park and gardens underwent alterations in the 1880s under Edward Boardman. The tiny hamlet of Swathing was once much larger, and is described in the Domesday Book as a relatively large and valuable settlement. The village has almost completely vanished, and the earthworks of the medieval village (NHER 11974 and 25910) are the only remains. Southburgh, meaning the ‘south hill’, is mentioned in the Domesday Book as a dispersed settlement with three mills and a church. It is possible that the settlement could date from the Saxon period and part of an Early Saxon brooch (NHER 31497) was found close to the hamlet. St Andrew’s Church (NHER 2975) was restored substantially in the late 19th century, although some medieval work has survived. Red Hall (NHER 25066) contains extremely rare examples of 19th century servants’ fittings. Wood Rising, which comes from the Old English meaning ‘a settlement of a man called Risa’, is in the south of the parish. In Domesday Book, the settlement was relatively substantial, with a large amount of woodland. The tiny hamlet of Wood Rising now only consists of a few houses, and the medieval church of St Nicolas’ (NHER 8829), but several enclosures on the edges of a former common, visible on aerial photographs, suggest that the hamlet may have been much larger in the medieval period, or that the settlement has gradually shifted to its present position. To the south of the hamlet is the site of Wood Rising Hall (NHER 8825), which was the seat of the Southwell family until the 18th century. The Hall was associated with a medieval deer park (NHER 8825), the location of which is unknown. Another medieval manorial site (NHER 8823 and 25241) has survived within Hazel Hurn Wood (NHER 40180). The manor house was moated, and the site includes a series of fishponds and the site of a dovecote. Hazel Hurn Wood (NHER 40180) itself contains medieval wood banks, as does the nearby Wood Rising Wood (NHER 40178), and Shepherds Fell Wood (NHER 40179). Sarah Spooner (NLA), 26 September 2005.